Replace=buy new, $6 cost. Form is to exit system (refund), cost 4% of balance. My bank cards break like this about once per year. The bank, however, does not charge for a new one. I've never had any card fail on me other than a PRESTO and TWICE - both broke in two. The second card was only a month old. Glad I could help out with the news story from the Ottawa version of the Metro. Almost got coffee stained as I laughed so hard at 200 in the previous couple of months. Follow up: Prestocard tweeted me to say they average 15 cards per month out of 1.4 million. I asked them to double check their math or if they were saying the City of Ottawa rep was wrong. Presto cards are not the same durability as bank cards. Try applying a little pressure to your bank cards. They're stiff, they don't really bend. Presto cards are thin, bend very easily and seem to have higher potential for snapping. 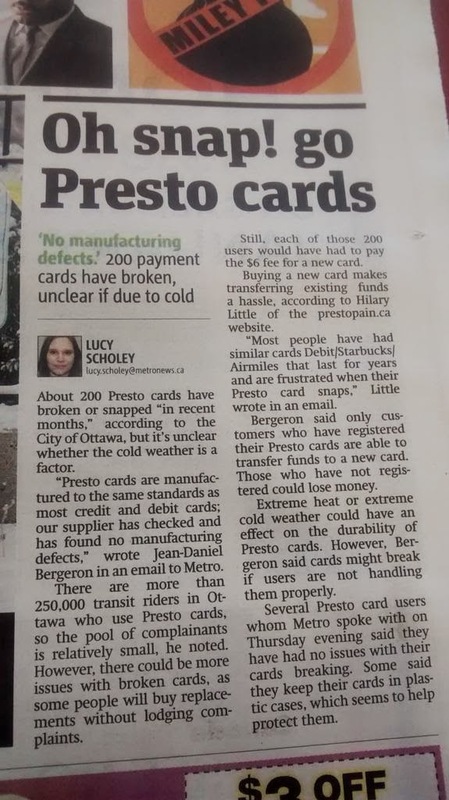 The other thing they don't keep in mind is that most of us don't handle our Presto cards the same way you do a bank card. You're running for your bus or train, you don't have time to fish your wallet out of your purse. You carry it differently and handle it differently. It needs to be more durable than a bank card and right now it is less durable than a bank card.